Professional barcode label creator software generates printable barcode labels with support to major Linear and 2D barcode font standards in an easiest way. 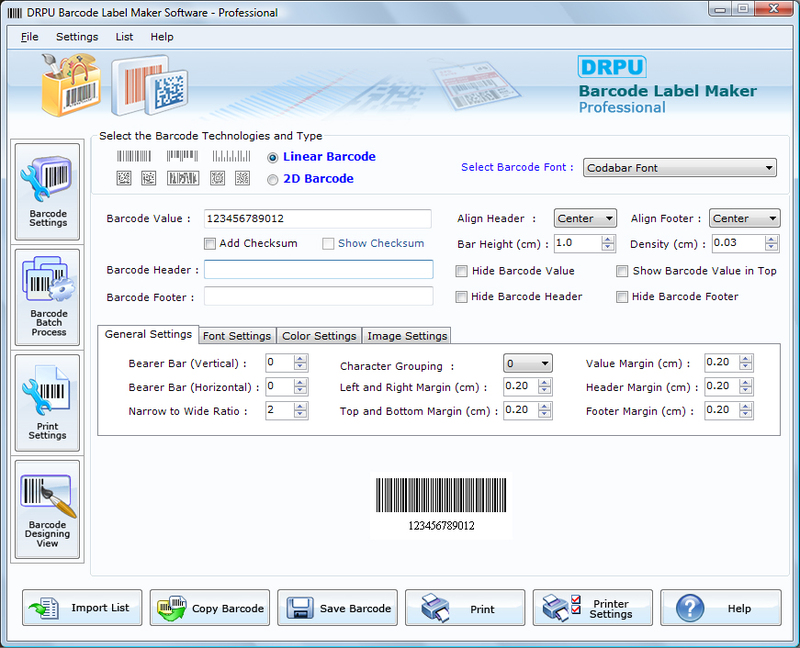 Affordable barcode label maker software produces multicolored high resolution text or image barcode labels and product stickers of any shape such as ellipse, sphere, elliptical, rectangle and saved them at specified application including MS-Word/Paint etc to enhance business productivity. ...... clicks in user-specified linear or 2 D barcode fonts including Code128, Code128 A, Code128 B, Code128 C, UPC-A, UPC-E, Code39, Code39 Full ASCII mode, QR Code, EAN13, EAN8 and much more on a single application. Download barcode label maker software provides accurate and cost effective business solution of barcode labeling that useful in retail sector, shipping, manufacturing, warehousing, postal industries and other sectors. Cost effective barcode label software provides standardized and comprehensive solution to create and print multiple barcode labels and asset tags by using sequential, constant value and random series. Our barcode label creator software capable to create high quality and eye attracting multicolor stickers for commercial usage. * Advance barcode labeling software design industry standard barcode labels with label designing tools. Makes unique remembered flash gift. ASP component that allows web developers to add barcodes to their applications. A Community Edition of the popular Internet browser Firefox. Barcode Image Maker creates labels, sticker, ribbon asset for 22 barcode Fonts. Qweas is providing links to Barcode Maker Standard Edition 7.3.0.1 as a courtesy, and makes no representations regarding Barcode Maker Standard Edition or any other applications or any information related thereto. Any questions, complaints or claims regarding this application Barcode Maker Standard Edition 7.3.0.1 must be directed to the appropriate software vendor. You may click the publisher link of Barcode Maker Standard Edition on the top of this page to get more details about the vendor.